Beijing, March 19: As pressure mounts on Beijing for its brutal policy of repression against its Uighur minority population in Xinjiang province, a government document revealed on Monday that 13,000 "terrorists" had been arrested in the province in a massive crackdown since 2014. Beijing said it cracked down against those with separatist leanings in the volatile Muslim-majority Xinjiang region since 2014. China has faced mounting criticism for the detention of thousands of Uighur Muslims in what the government calls are "education camps". "Since 2014, Xinjiang has destroyed 1,588 violent and terrorist gangs, arrested 12,995 terrorists, seized 2,052 explosive devices, punished 30,645 people for 4,858 illegal religious activities, and confiscated 345,229 copies of illegal religious materials," a white paper released by the Chinese government on Monday said. 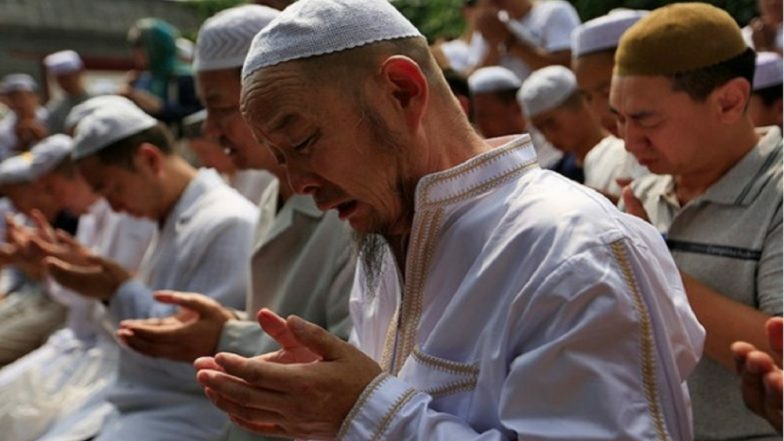 It said that some areas in Xinjiang were severely disturbed by terrorism and the infiltration of religious extremism. "For this reason, some people cannot speak, read or write in standard Chinese, have a weak understanding of rule of law, and have difficulty finding employment through a lack of employable skills. As a result, such people are more inclined to be incited or coerced into criminality by terrorist and extremist forces," it said. China has made significant progress in its counterterrorism and de-radicalisation efforts in Xinjiang, the paper stated. "However, the three forces of terrorism, separatism and extremism are not gone; their influence can still be felt. And the 'East Turkistan' forces are in search of opportunities to create trouble. We still face a severe and complex situation in combating terrorism and extremism in Xinjiang," it said. Separately, the Chinese Foreign Ministry spokesman Geng Shuang has denied China is "buying the silence" of Muslim countries with massive investments through the ambitious Belt and Road Initiative (BRI), of which the USD 60 billion China-Pakistan Economic Corridor (CPEC) is a flagship project. Diplomats from Pakistan and several other Muslim countries, who were recently taken on a guided tour of Xinjiang following allegations of detention of over a million Uighurs, said there was no religious and cultural repression in China. Asked whether China was investing heavily in Muslim countries to buy their silence, Geng told the reporters that the BRI investments had nothing to do with Xinjiang related issues. "China pursues preventive counter terrorism measures. I believe the international community recognises this," he said. The United Nation’s human rights panel said in August last year that it had received many credible reports that about a million ethnic Uighurs in China had been detained in "massive internment camp that is shrouded in secrecy". China has since defended the camps, saying they are re-education camps aimed at de-radicalising sections of the Uighur Muslim population from extremism and separatism. The U.S. and several other countries, besides UN officials, have expressed concern over these 're-education' camps.